Gorham Savings Bank granted 14 wishes in September and October totaling nearly $20,000 as part of its 150th anniversary Wish Tree program. With a goal of granting $150,000 worth of wishes in 150 days, the latest wishes granted included lumber for an elderly Standish woman whose neighbor wanted to build her a porch, eye exam and new glasses for a man with migraines, and transportation assistance for a Scarborough man with advanced macular degeneration who cannot drive but needs to bring his wife to chemotherapy. Additional wishes granted included wireless headphones for actors of all ages at the Schoolhouse Art Center in Standish, a Hannaford gift card for a single mom working full-time to help support her daughters, and heating oil and groceries for a woman fighting stage IV lung cancer. More wishes will be granted and announced in November. Putting its own spin on an age-old tradition, Gorham Savings Bank, in celebration of its 150th anniversary, placed Wish Trees in 12 branches and is inviting customers and non-customers alike to stop by, write down a wish on a tag, and tie it to the tree – now through November 15. 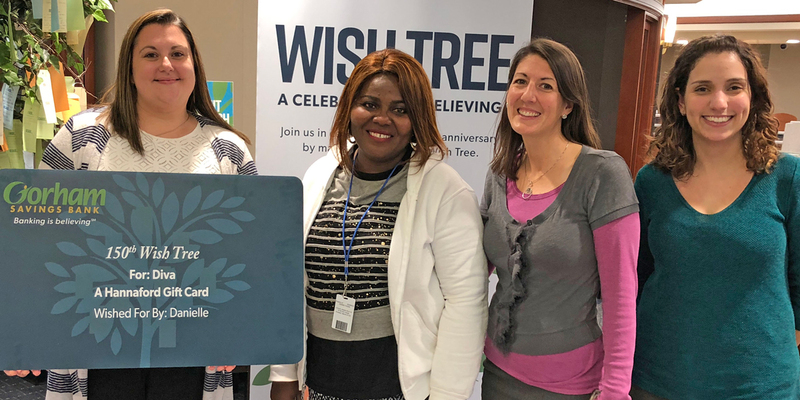 To learn more about the Wish Tree Program, and for complete terms and conditions, visit the Wish Tree Page.